Library image #460: Photo taken off of Blue trail in Great Swamp National Wildlife Refuge Wilderness Area in Harding Township. The United States Congress designated the Great Swamp National Wildlife Refuge Wilderness (map) in 1968 and it now has a total of 3,660 acres. All of this wilderness is located in New Jersey and is managed by the Fish and Wildlife Service. Roughly 25,000 years ago, where the Wisconsin Glacier reached its furthest point south and stopped, the creation of Great Swamp began. With cattail marshes, wet meadows, swamp woodlands, and ridges thick with oak, beech, and laurel, Great Swamp provides a home for 39 species of mammals including mice, moles, skunks, raccoons, otters, foxes, white-tailed deer, and the endangered Indiana bat. Migratory birds see Great Swamp as a "nest and rest" (244 species have been identified). Numerous reptiles and amphibians have taken up residence, including rare bog turtles, wood turtles, and blue-spotted salamanders. The Great Swamp National Wildlife Refuge was established in 1960 following grassroots action to save the area from being developed into a major metropolitan airport. In 1968, the eastern half of the Refuge was designated as the very first Wilderness Area within the Department of the Interior. About 8.5 miles of primitive trails provide access during daylight hours only, and camping and picnicking are not permitted. 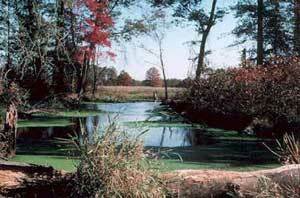 Planning to Visit the Great Swamp National Wildlife Refuge Wilderness? Visitors are invited to enjoy the Great Swamp NWR Wilderness Area but asked to follow the seven standard Leave No Trace principles. Remember to take only memories and leave only footprints!